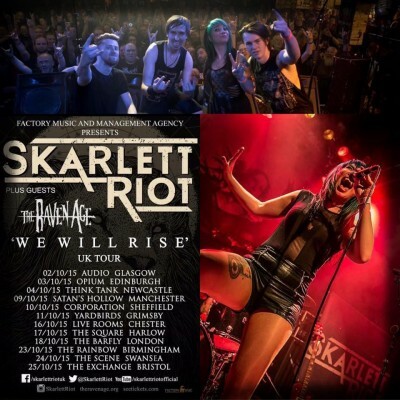 Skarlett Riot are set to hit the road across the UK in October in support of their latest EP We Are The Brave. 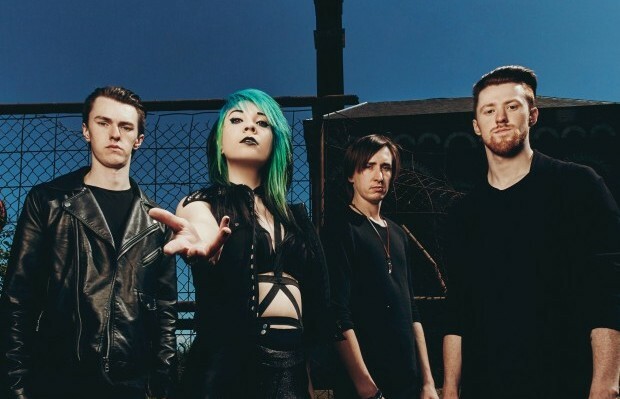 National Rock Review recently caught up with Skarlett Riot‘s lead singer Chloe Drinkwater to talk about their touring plans, influences, and their new single Ignite. You’ve recently released your new single ‘Ignite’ via iTunes, could you tell us a little bit about the song and the influence behind it? Chloe: Yeah, we’ve just released it. Basically, we have an EP called We Are The Brave which was released around March time, but Ignite didn’t make the EP and we had it alongside. So we thought we would release it because it will go down really well and we wanted to use it to promote our October tour. We have it as a new song that people haven’t heard before, so they can come to the shows and hear it live there first. The influence of the song at the time I was listening to In This Moment and Bullet For My Valentine, they influenced the songwriting quite a lot. NRR: Is there any chance that Ignite might be released on a later album, or is it going to be a one-off single? 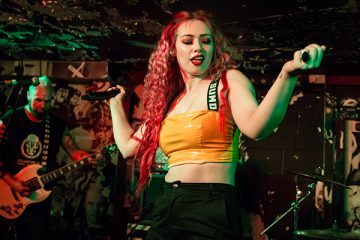 Chloe: At the minute it’s a one-off single, but if it kicks off and everybody really enjoys it then there is no harm in adding it on as a bonus track to the next release if people love it that much. 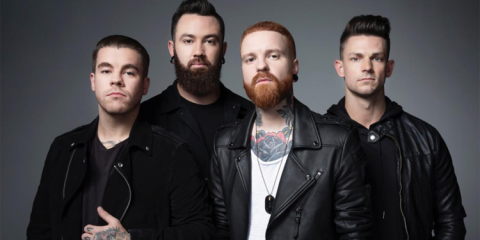 NRR: We Are The Brave is a lot heavier than your previous material was that a conscious decision to go a bit heavier? Chloe: Yeah, we did our album Tear Me Down in 2013 and after we recorded that one we just started writing more and more music and we didn’t really stop writing. Everything we have written since then has been a lot heavier in general. I think we kind of planned it to be a little bit heavier because we missed it. The Tear Me Down album was very commercial based, it was kind of pop/rock, it still had its heavy elements, but we thought that our sound was a little bit heavier. We all listen to different influences as well, and a lot of what we listen to is a lot heavier so I think naturally it just progressed into a heavier material. The guys listen to the likes of Asking Alexandria, Escape The Fate you know heavier style bands but I still listen to my kind of pop/rock bands so we have a heavy element there in the tracks and then you have my pop/rock vocals over the top, so it keeps it really heavy, but it also has that commercial twist to it as well. NRR: Where do you find your inspiration for your songwriting? Chloe: I started singing when I was 13, and I was actually listening to Busted and Avril Lavigne, you know the bands which shouldn’t be named (laughing) dead embarrassing. Then I started listening to Paramore, Shinedown, Bullet For My Valentine and Disturbed so that’s where the influences come from. Shinedown particularly with their lyrics, they mean a lot to people. I like to write lyrics which are quite meaningful, I like everyone to be able to relate to them and to be able to connect to them in their own way. NRR: If you could collaborate with any artist who would be your dream collaboration? Chloe: I would say Skindred or Papa Roach. Skindred because it would be interesting they are a lot different to us, they have reggae elements in there so it would be really interesting to connect with them a to do something a bit different to what we normally do. Papa Roach because I’ve been listening to them since we started the band. At 12 or 13 I remember Getting Away With Murder and the early material which they brought out. I’ve grown up listening to Papa Roach, so they mean a lot to me as a band. NRR: You’ve been out on the road quite a bit already this year. How have the shows been going? Chloe: They’ve been really good, yeah. Earlier this year we supported Ozzy Osbourne’s guitarist Gus G on his UK tour, those shows were amazing. Everything so far has been pretty much sold out. We did Camden Rocks Festival and Bullet For My Valentine headlined that, which was amazing. We are doing a headline tour in October. We thought that we would add that in to see how our fan base has progressed and to challenge ourselves to see if we could sell a few of those out as well. NRR: What can your fans expect from your show this time around? Chloe: Lots of high energy. I think people probably know Skarlett Riot for that. We like to put everything into our performance, deliver the songs to the full and get the crowd involved and comfortable and have everybody jumping around. Yeah, just a high energy performance and to have fun really. It’s going to be a great tour and we’ve got a few surprises in there like I said we have our new single which we are going to play live for the first time as well. 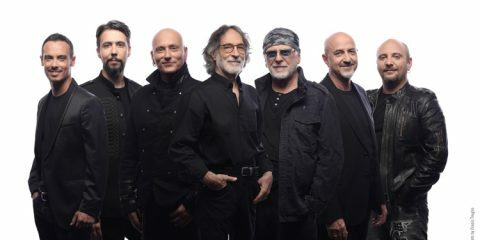 NRR: Of all of the dates on the upcoming tour which show are you looking forward to the most? Chloe: Oh that’s difficult. I mean obviously we are looking forward to all of them but if I had to pick one I would say London because we are playing Barfly for the first time which is quite a big venue as well. It’s going to be good, challenging and nerve wracking to see what the turnout is going to be like for that one because we are pushing it as much as we can. I guess the London scene is a big thing in the UK, so we are looking forward to that one. In London, we did our last headline show at a smaller venue and that was really good. I mean to do headline shows in London and have all those people turn up and sing along, I think that was our best show on the last tour we did. We didn’t expect it to be either, everyone was really up for it, jumping around, singing along so we are hoping for that energy as well this time around. NRR: What is your favorite track to perform live and why? Chloe: I would say Divide Us which is the first track at the moment that we perform live, it’s our opener. I love that one because it’s full of energy, I think it’s the most upbeat track that we do and it’s really in your face you get on the stage and people can’t take their eyes off you. 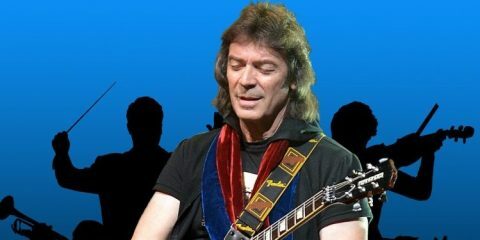 It’s one where I can really jump about, because I play guitar as well so it’s nice to go on the stage to start with and do all my running around and get myself out of breath and then go back to play guitar for the rest of the set (laughing). So yeah ‘Divide Us’ definitely. NRR: You’ve got The Raven Age supporting you on these upcoming shows who are a great upcoming British Rock band who we recently saw with Steve Harris British Lion. Have you had a chance to see them play yet? Chloe: Unfortunately not, we’ve heard so much about them and we can’t wait to have them supporting us. We are going to go and see them this coming weekend, they are playing in Grimsby which is close to our home town. So we are going to go and turn up and surprise them, meet them and say hello and listen to what they do and everything so that should be good. NRR: As a band you’ve been together since 2010. How did you all meet? Chloe: We actually met a couple of years before that. The guitarist and drummer are brothers. I went to school with the guitarist and we had a different bass player at that time. We kind of met when we were 15-16, so we are looking at a good 8 to 9 years ago now. We ended up with a new bass player and kind of formed Skarlett Riot about a year before that. We started jamming some covers whilst we were at school and doing the covers scene, pubs and clubs and stuff. Then we thought we want to take this a bit more seriously now, we wanted to start writing our own music. So we all got together and just started writing songs since then. It’s been good actually because I think it’s helped us write together as a unit and you kind of get used to how each other works and the best ways of writing when you’ve been together for so long and you know your band members, it’s like being a little family I suppose. NRR: Obviously you’ve played a lot of cool shows already having played the likes of Download Festival. If there was anywhere in the world where would be your dream gig? Chloe: I would say the Warped Tour. That’s just because you’ve got so many shows on the Warped Tour, it’s about 40 shows so that’s getting the most out of a festival I suppose (laughing) because we absolutely love touring. It would be amazing to have such an intense tour and share a bus with all of the bands it would just be a great experience which we would love to have. 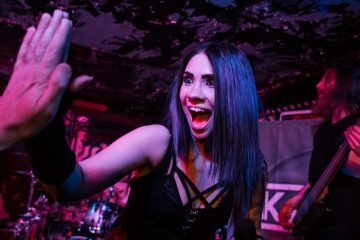 NRR: What else does Skarlett Riot have in store at the moment? Obviously apart from the upcoming tour, do you have any plans to go back into the studio? Chloe: Yeah, we are heading back into the studio at the end of the year just before Christmas time. So at the moment we are in the middle of writing loads of new songs as well as putting together the set for the October run. So we are quite busy with that at the moment. We will be releasing something in mid-2016, so at the minute we are just writing as many songs as we possibly can and when we feel like we’ve got the right songs for our next release we will go and record them in December. NRR: Thanks for taking the time to speak to us we really appreciate it, and hopefully we will get to see you out on the road later in the year. Chloe: Yeah, thanks for having us. Mike Shinoda’s Fort Minor To Play London’s Scala on Sept 8.